Isis is sitting patiently on the back seat, harness and safety lead attached. Ji. opens the gates and I turn the ignition key. Blerrrrghhh…silence. A combination of sound and no sound which a driver never wants to hear. Ever. It is quite difficult to persuade poor Isis to leave the car. What did she get in for? And then we are moving off in the opposite direction to that which we take on our road walks. And anyway we usually only have one road walk a week, at most. We’ve already had that. So why…….? These are the questions Isis might be asking if she were a pain in the backside six-year-old. Fortunately, she’s a dog. So she stands still on the pavement to give me time to work out that we’re walking the wrong way. Then, deciding she’s supposed to follow, she looks nervously ahead at the shadows made on the paving slabs by a tall hedge. She sidles over to a car parked by the kerb. If she leans against it for a while, we might stop being silly and get back in the car. She is persuaded to walk round the corner where the shadows are fewer and less dense. It takes almost thirty minutes to reach the park and we spend about forty minutes there. The sun is surprisingly strong for January. People feel it warming their backs: they smile and comment about how lovely it is. It’s not lovely for Isis who can be terrified by shadows. Although we try to keep to the least shadowy areas, it’s impossible to avoid all of them. But Isis is a little star. Although she sometimes hesitates, as she picks her way carefully over the grass and along the paths, for most of the way she walks beautifully by my side like the brave little dog she is. 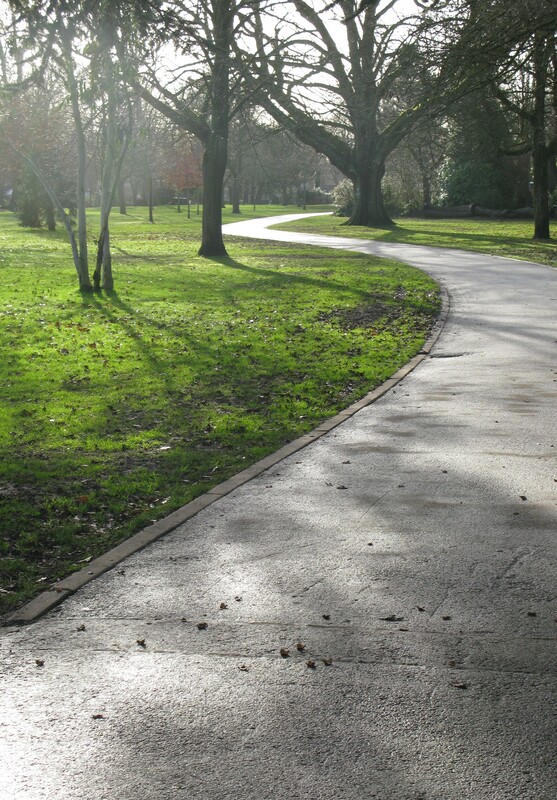 This entry was posted in walking in the park, walking my deaf/blind dog and tagged blind dog walks, deaf/blind dog, deaf/blind dog is brave, Kings Heath Park. Bookmark the permalink. I wish there was a ‘like’ button for your posts! Thanks Kerry. I think the ‘like’ button is in the last little rectangle under the heading ‘share this:’. Underneath it says ‘be the first one to like this.’ And it changes from blue to orange when you press it. Is it – or am I being characteristically dim? PS It is the one. I pressed it to check and got a sarcastic note from WordPress telling me I had ‘liked’ my own post!